Once power trowelling has been completed to produce a dense, burnished finish, AQURON 1000 is spray applied to the surface. AQURON 1000 transforms the moisture within the slab into a gel which fills the porosities of the concrete matrix. AQURON 1000 provides complete curing assistance, to produce a light coloured concrete with anti-dusting properties and a hardened surface which develops a sheen with regular cleaning and use. 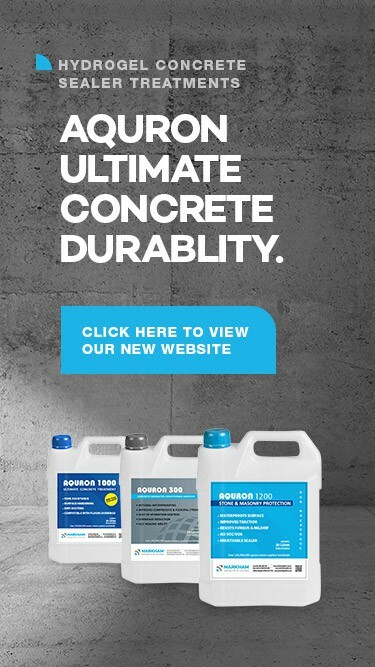 AQURON 1000 hardens the both the surface and matrix of the concrete due to its ultra deep penetrating ability. This eliminates the formation of a surface crust which has a tendency to craze and delaminate. hours, AQURON 1000 does not off er the benefits of curing assistance. CRETEPOLISH MAX. Be aware that oil, mud, and other similar materials on a smooth surface can be a potential hazard and good drainage and house keeping is therefore imperative. pressure. In these situations use AQURON 2000. Should your concrete surface require immediate sheen enhancement, the surface is wet scrubbed and depending on the surface finish or porosity, a light application of CRETEPOLISH MAX may be applied. CRETEPOLISH MAX is a new generation, water-based, metal crosslinked, synthetic polymer polish which provides immediate initial sheen enhancement and stain resistance for AQURON treated surfaces. CRETEPOLISH MAX has an integral stain blocking additive which provides stain resistance against most common stain-causing agents. It is designed for use on interior diamond honed or powertrowelled finished floor surfaces where sheen enhancement and stain resistance is desired e.g. wholesale and retail warehouse floors which require an easy to-clean, stain resistant floor. CRETEPOLISH MAX can also be applied to acrylic, epoxy and polyurethane coated floors to increase or restore sheen. Always treat a small trial area first to ensure compatibility.